Orlando is heaven to kids. Which child doesn't dream of going to Disney World? But there is more to Orlando for kids than Disney World alone. Along International Drive and the US192 are a lot of cool spots to take your kids to which don't even cost you that much money. 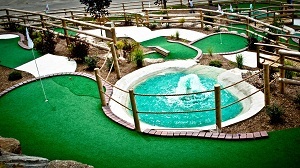 A few examples: mini golf, go-karts, or those roller coasters with them tight corners (without loopings). 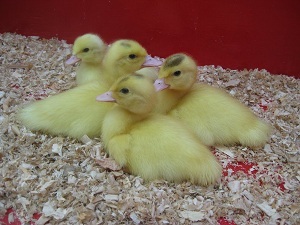 For example Fun Spot has even got attractions for 2-6 year olds. Also don't forget Gatorland or dinner shows. Here are a few tips to take your kids to. Note: these are not just for kids, also fun for older children and adults! 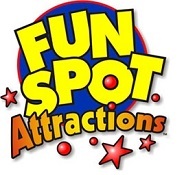 Fun Spot has got two locations, one on the US192 (Fun Spot USA) just next to Old Town, the other one is just off International Drive (Fun Spot Action Park). When you drive past Fun Spot USA, you will notice the world's largest SkyCoaster, standing over 300 feet tall! It is a thrill ride which combines the thrills of a free fall and hang-gliding in one action packed ride. Next to that attraction, Fun Spot offers a lot of other attractions like Go-Karts, bumper cars, thrill rides, pre-school rides. Fun for all ages. Check out this video of the Skycoaster I've made at Funspot USA in Kissimmee. Fun Spot Action Park just off I-Drive expanded in size in 2015, be sure to check both out. 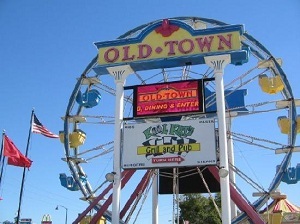 Old Town is situated just next to Fun Spot, directly on the US192 and is widely known for their cruise nights, featuring pre-1975 muscle cars and hot rods. Not are they only known for the car cruises, Old Town also features almost 20 rides from Flying Teacups to the Drop Zone Super Shot. The rides in the back are more for the smaller kids. If you want to go shopping or have a bite, Old Town is also the place to be. With over 60 shops and restaurants, there's plenty to do, see and taste in Old Town. When you go there, be sure to go in the weekends. The rest of the week it's pretty quiet out there. Watch this video I made of Old Town on YouTube. Parking: FREE, but don't park where it is not allowed, they will tow the car away! 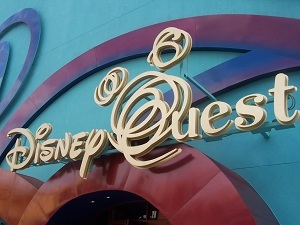 Disney Quest is situated in a five-story building in Disney Springs (formerly known as Downtown Disney). It is an indoor interactive theme park with games spread over the five floors. There are games which require more than one player, these aren't just video games (though they are available too in the Replay Zone) but 'real life' games or attractions as you might call them. A few examples of attractions are Cyberspace Mountain (create your own roller coaster and ride it too), Pirates of the Caribbean: Battle for Buccaneer Gold, Radio Disney Song Maker (make you own song and buy it later) and Mighty Ducks Pinball Slam (become a human pinball). Disney Quest also features two restaurants, so no need to walk far when you are hungry or thirsty from all the games and attractions. Disney Quest closes permanently on the 3rd of July 2017. It will be replaced by the NBA Experience. Along the US192 and International Drive are some mini golf courses. On US192 you can find Pirates Island, Congo River Golf, Pirate's Cove Adventure Golf, Mighty Jungle Golf Adventure and Bonanza Golf. On International Drive you can find Hawaiian Rumble Adventure Golf, Pirate's Cove Adventure Golf, Volcano Island Mini Golf and Congo River Golf. Don't forget about Disney's Winter Summerland Miniature Golf and Disney's Fantasia Gardens Miniature Golf. All locations and contact information can be found on this Google Maps link. Hands-on learning is what's in store with plenty of activities that will delight and amaze people of all ages! Green Meadows Farm provides guided tours to educate children and adults about farm animals by touch, sight, smell and sound; it is truly a sensory learning experience with over 300 animals as your teachers. Some of the things you can do is take a train ride, pony rides for children, a tractor-drawn hayride and even milk a cow! 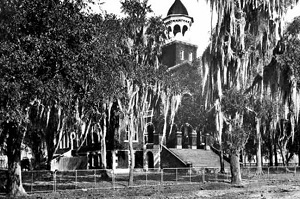 Join us as we take a leisurely stroll and search along the shadowy streets and alleys of Kissimmee's Historic Downtown District to hear stories of the unexplained and strange. See paranormal pictures taken along the tour route and bring your camera to capture paranormal pictures of your own. “Catching a wave” has never been such a rush! Fantasy Surf in Kissimmee, offers a truly interactive aquatic sport activity. It’s ideal for family participants of all ages who will slide, ride, and surf in a safe, controlled environment. Fantasy Surf features the patented FlowRider™ system that has the look of surfing and wakeboarding, ride of snowboarding, and tricks of skateboarding. The thrills and techniques developed from this water experience have even spawned a new competitive sport: Flowriding! This is not just for kids, also for adults this ride will truly give you a thrill! Fantasy Surf is closed for repairs. Check website to see when they open again. 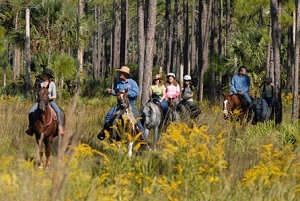 Let us take you on an unforgettable journey into Forever Florida, a 4700 acre eco-ranch and wildlife conservation area boasting beautifully untamed wilderness, natural streams, wetlands and dense cypress forests. We've got so many ways to explore this amazing place. Sign up for EcoPark Admission to conquer our biggest adventures including The Rattlesnake, the first zipline roller coaster in the USA! Or, kick back and relax on a Coach Safari, saddle up for a fully guided Horseback Safari, soar over it all on Florida's biggest and All New Zipline Safari™ or pedal through the treetops on the Cypress Canopy Cycle!